LevelAc Switches and Control - SL-400 Series | Texas Valves & Instruments, LLC. 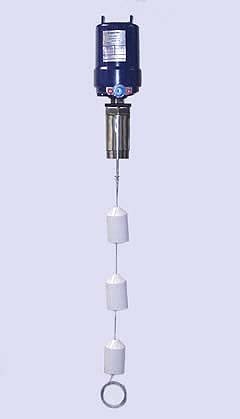 Level Ac Displacer Type Level Switches are designed for top mounting and are particularly suited for the level control of liquids under conditions of turbulence or agitation. Their operating principle produces relatively wide switching differentials. Changes in operating differentials and actuating levels may be made in the field by repositioning the displacers along the stainless steel cable. Porcelain displacers are standard on the SL-400 series. Standard cable length is 10 ft. Note: Other flange sizes, ratings and materials available on order. Displacers: Porcelain standard. Stainless Steel available. See Model Numbering, Table 6. Clamps: 316 Stainless Steel standard. Magnetlc Armature: 430-F corrosion resistant steel. NOTE: Since specific gravity and temperature affect calibration, these values must be specified on order. Differential Adjustable Minimum: 4" Maximum: to cable length, 10 ft. standard. Explosion-proof: Heavy cast aluminurn base and cover. With drain; NEMA 7A, B, C, D; 8C, D; 9E, F, G; 10; 12; 13. Vapor-proof: Similar to Explosion-proof except with "O" ring seal at base and no drain, NEMA 5; 7C, D; 9E, F, G; 10; 12; 13. Snap Type: Equipped with one or two SPDT electrical snap switches or one pneumatic switch. Model SL-400 LevelAc level switches use 'heavier-than-liquid" displacers which sink below the surface of the liquid under control. Spring suspension balances the normal displacer weight and as the liquid level rises around the displacer, it is buoyed up by a force equal to the weight of the liquid displaced. The apparent weight loss allows the spring to move the internal armature into the externally mounted switch's magnetic field to produce switch operation. Internal Wiring: 20 gauge copper (105 strands of no.40 wire for extreme flexbility) insulated with silicone rubber. Snap Switches Characteristics: Non-mercury SPDT snap-acting type. Fully enclosed in high-strength plastic. A pneumatic valve with bail seating for tight closing and designed for mounting on a snap switching station. Snap-action of the switch station produces "on/off" or "closed/vent" operation. May be mounted to vent on high level or low level. Only one pneumatic switch per station may be installed.